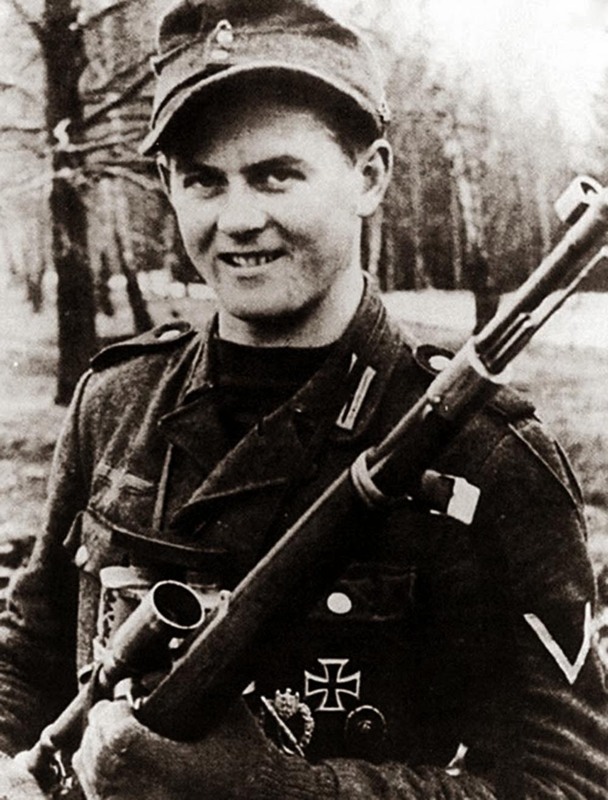 Matthäus Hetzenauer, Austrian sniper with 345 confirmed kills, 1944. Matthäus Hetzenauer was an Austrian sniper in the 3rd Mountain Division on the Eastern Front of the World War II, who was credited with 345 kills. His longest confirmed kill was reported at 1,100 meters (3,600 ft). Hetzenauer was also a recipient of the Knight’s Cross of the Iron Cross. The Knight’s Cross of the Iron Cross was awarded to recognise extreme battlefield bravery or successful military leadership. He utilised both a Karabiner 98k sniper variant with 6x telescopic sight and a Gewehr 43 with ZF4 4x telescopic sight. He saw action against Soviet forces in the Carpathians, Hungary and Slovakia. On 6 November 1944 he suffered head trauma from artillery fire, and was awarded the Verwundeten-Abzeichen three days later. Gefreiter Hetzenauer received the Knight’s Cross of the Iron Cross on 17 April 1945. Generalleutnant and Divisions commander Paul Klatt had recommended Hetzenauer because of his numerous sniper kills, which totalled two enemy companies, without fear for his own safety under artillery fire and enemy attacks. Hetzenauer was captured by Soviet troops the following month, and served 5 years in routinely appalling conditions in a Soviet prison camp. He died on 3 October 2004 after several years of deteriorating health. Any factual error or typo? Let us know. A true German hero. I salute you dear Sir and thank you for your service. May you find peace in that place they call Valhalla!